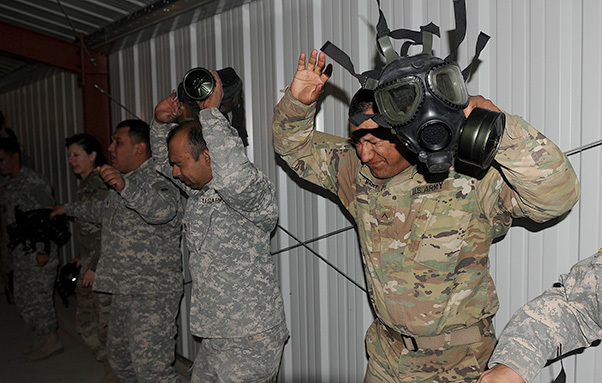 Soldiers from the 311th Sustainment Command (Expeditionary), based in Los Angeles, Calif., prepare to be exposed to CS gas as they wait inside a gas chamber at Fort Irwin, Calif., Oct. 14, 2017. 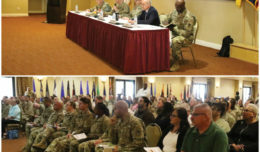 A busy three-day battle assembly for Soldiers of the 311th Sustainment Command (Expeditionary), U.S. Army Reserve, as they trained at Fort Irwin, Calif., Oct. 13-15, 2017. 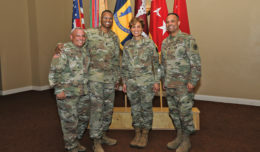 Their training consisted of the service members qualifying with their individually assigned weapons during the day, followed by an intense experience of going through the gas chamber when night fell. The Soldiers also tested their physical endurance and concentration as they attacked an obstacle course. 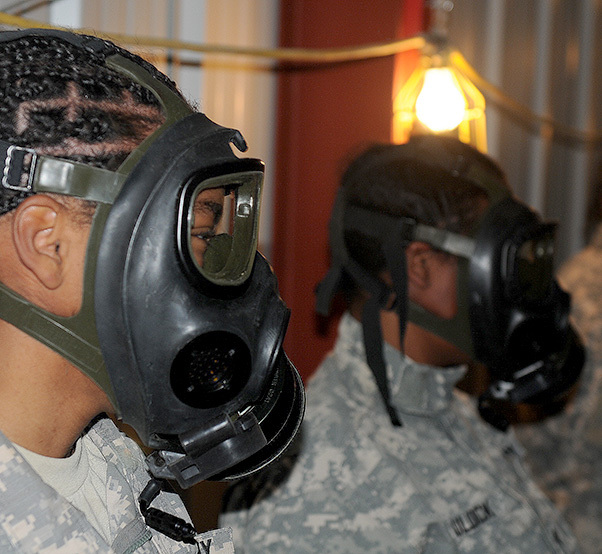 A Soldier from the 311th Sustainment Command (Expeditionary), based in Los Angeles, Calif., performs the side straddle hop while being exposed to CS gas in the gas chamber at Fort Irwin, Calif., Oct. 14, 2017. 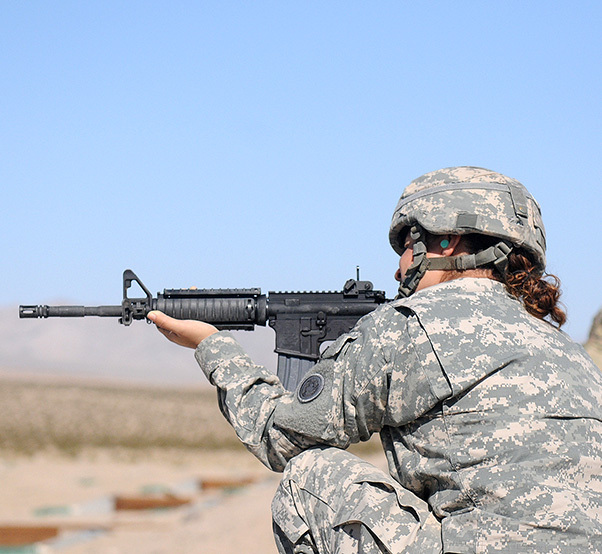 A Soldier from the 311th Sustainment Command (Expeditionary), based in Los Angeles, Calif., scans her lane for targets during weapon’s qualifications at Fort Irwin, Calif., Oct. 14, 2017. 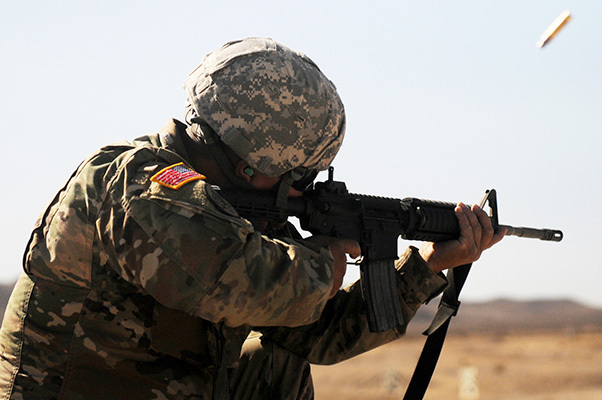 A Soldier from the 311th Sustainment Command (Expeditionary), based in Los Angeles, Calif., fires at a target during weapon’s qualifications at Fort Irwin, Calif., Oct. 14, 2017. 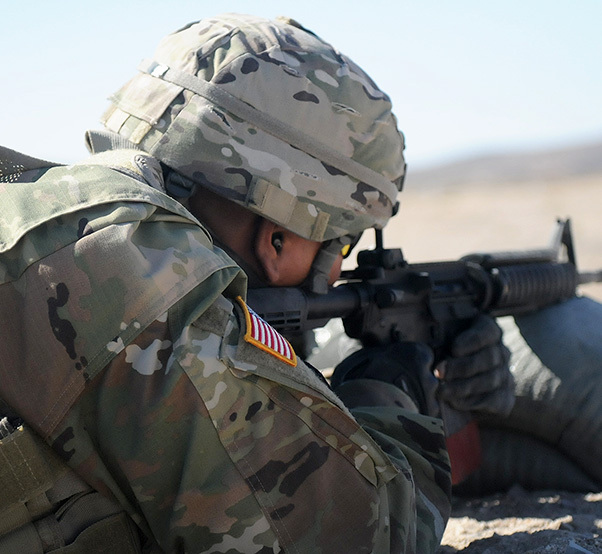 A Soldier from the 311th Sustainment Command (Expeditionary), based in Los Angeles, Calif., scans his lane for targets during weapon’s qualifications at Fort Irwin, Calif., Oct. 14, 2017.